The Pioneer Girl Project is always on the lookout for new information, and sometimes, thanks to the courtesy of readers like you, it just turns up out of the blue—or in this case, out of Minnesota. Here’s the story as Project staff experienced it. During their second stay in Minnesota, the Ingallses were neighbors of Mr. and Mrs. Pool and their grown daughter, Missouri, who kept house for her parents. In Pioneer Girl: The Annotated Autobiography, Laura Ingalls Wilder remembers Missouri’s wonderful garden full of beautiful flowers and how she would smoke “a very small, white clay pipe” as she told “stories of Missouri, the state for which she was named.” Missouri even helped to care for Mary Ingalls during the illness that caused her blindness. According to Wilder, Missouri had several siblings and was the only one not married. At last they learned the reason: Missouri’s mother, hoping to keep her daughter home to care for her in her old age, had been working to thwart Missouri’s courtships. Yet, despite her mother’s machinations, Missouri did finally marry and return to Missouri—only to die tragically during childbirth. Census data got us nowhere; there simply was no Missouri Pool listed in Minnesota at the right times. However, Nancy Tystad Koupal’s close reading of the Redwood Gazette for the years 1876–1879 turned up a Thomas Pool, who lived in Walnut Grove, Redwood County, Minnesota, “with his wife and daughter.” Armed with this information, we went back to the census: was there ever, anywhere in the United States, a Thomas Pool with a daughter Missouri? There was—and moreover, there was plenty of information to confirm that his family was the one Wilder remembered and to confirm that Thomas Pool and his wife Annie had moved to nearby Brown County, Minnesota, in 1880. But—now here’s the thing—in 1880, Missouri Pool is gone. She’s enumerated with her parents in 1870, but by 1880, she was either married, dead, or both. With no married name, it was impossible to track her beyond that point (Missouri was a more common first name than you might think). So there the matter rested. “There is no further trace of her,” was the conclusion in Pioneer Girl: The Annotated Autobiography. “She would have been about forty years old” (p. 141n76). Enter Vincent and Dawn Irlbeck. These residents of Willow Lake Township in Redwood County read this annotation and recognized a familiar local name. They let us know that Missouri Evans, née Pool, was buried on a nearby farm. When we contacted them to follow up, they even went out and took some pictures of the grave marker for us. 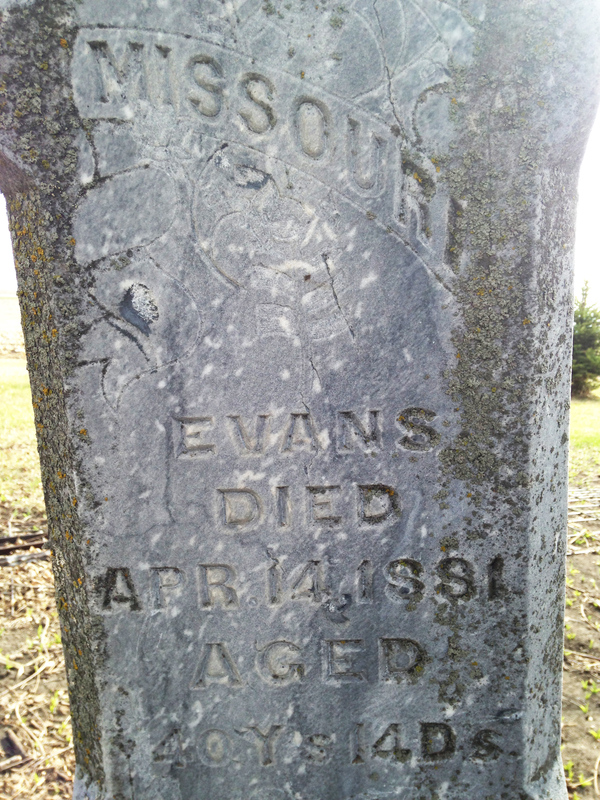 As you can see, Missouri Evans died in early 1881 at the age of forty—about the right age for our Missouri Pool. Was it the same woman? Yes, it was. Now that we had her married name, everything fell into place. Missouri Evans’s 1880 census data matched what we would expect to see in Missouri Pool’s. The census data led to marriage records, and soon we had a clearer picture of Wilder’s friend. Missouri Pool married widower Henry Evans on March 14, 1880, in Brown County but she died thirteen months later. No death records are immediately available, but according to the Irlbecks, local tradition says that Missouri, like too many women of the nineteenth century, died in childbirth. Clearly, she did not return to her name state of Missouri, as Wilder believed, but had stayed nearby in Minnesota. By the time of her death, however, the Ingalls family themselves had moved on—to Dakota Territory and the Hard Winter. Incidentally, two of Henry Evans’s other wives are also buried in this private cemetery: Anna, who died February 27, 1880 (we know, right?! ), and Amelia, who died March 29, 1884. The women of Minnesota must have breathed a collective sigh of relief when the multiple widower packed up and moved to Canada—taking one final wife with him. We thank Vincent and Dawn Irlbeck for contacting the South Dakota Historical Society Press with information on Missouri Pool and for taking the pictures of the Evanses’ gravesites.